Lies on the ancient sacred hill of Srigiri, the exotic temple of Srisailam is a temple complex date back centuries ago. The unique combination of a major god and goddess shrines under one roof makes Srisailam one of the most exciting holiest sites, which is worth exploring. Brahmarambha Mallikarjunaswamy Temple, Sikharam temple, Sakshi Ganapathi Temple, Srisailam Dam and Akamahadevi Caves are some of the worth discovering sites of the region. Take a walk around this holy site, witness the gorgeous Shrines of various gods and goddesses and make your life colourful with the blessing of God you have faith in. At Tour My India, we give boost to your religious faith and offer a well organized Hyderabad Srisailam weekend tour. Dip yourself in the pond of spirituality and plan a tour to Srisailam, the holy site of India during your upcoming weekend. 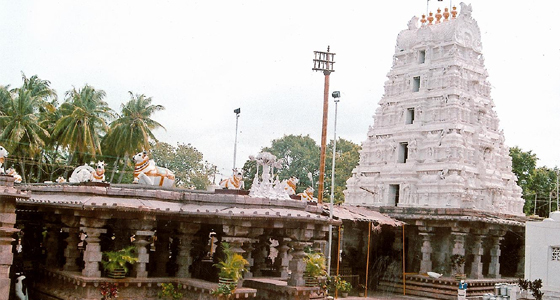 At Mallikarjuna, the shrine of Lord Mallikarjuna is beautifully located on a flat top of Nallamalai Hills, Srisailam. It is believed to be one of the most ancient kshetras in India. Nallamalai is also named as Srigiri, Siridhan, Srinagam and Sriparvatha. For centuries, it has been a popular centre of Saivite pilgrimage. The importance of this Divya Kshetram is noted by the fact that while performing our daily household rituals we specify place of location of our reality with reference to Srisailam. After breakfast, we will leave for Hyderabad. En-route, we will visit Srisailam Dam and Akamahadevi Caves. The cave was the seat of many brutal and secret Saiva divisions like the Kapalikas that fact in ancient medieval literature. It is believed that the Akkamahadevi, the famous lyricist, ascetic and philosopher did forfeit in this cave and worshipped the Sivalinga naturally existed in the deep and dark end of the cave.